Clara Sanchis Sarti holds a BA in English Studies with a Minor in Asian Languages and Literatures and a BA in Audiovisual Communication, both of them taken at the University of Valencia (Spain). She has worked as a translator for the Web and Marketing Unit of the UV and as a photographer at FotoEstudio Guirau. 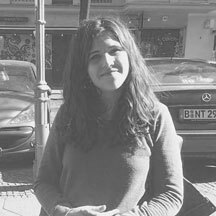 She is currently a research intern for the group Intersexualities at the Margarida Losa Institute for Comparative Literature of the University of Porto where she gathers information on women scientists in history. Her main areas of interest include Literary Studies, Communication Theories and Postcolonial Theories.